31 August 1986: At approximately 11:41 a.m., Pacific Daylight Time, William Kenneth Kramer departed Zamperini Field (TOA) at Torrance, California, flying a Piper PA-28-181 Archer II, FAA registration N4891F. The PA-28-181 was a single-engine, four-place, light airplane with fixed tricycle landing gear, built by the Piper Aircraft Corporation in 1976. It carried the manufacturer’s serial number 77-90070. The airplane was owned by William Kramer. In addition to the pilot, there were two passengers on board, Kathleen O’Connell Kramer, Kramer’s wife of 30 years, and their 26-year-old daughter, Caroline. The family’s destination was Big Bear City Airport (L35), high in the San Bernardino Mountains of Southern California. 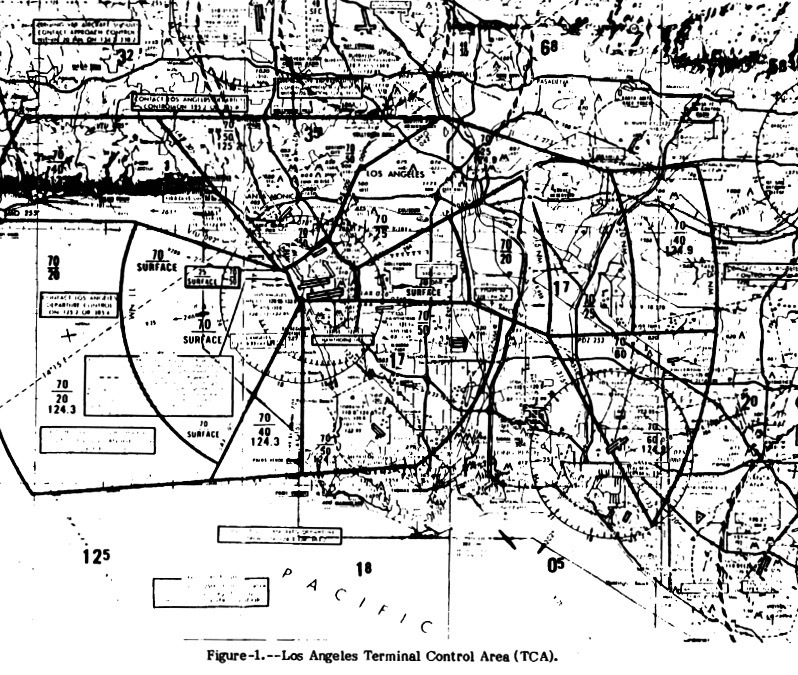 Photocopied image of a Los Angeles Terminal Control Area (TCA) chart, circa 1986, from NTSB report. Three major airports in the immediate area reported that the sky was clear and visibility was 14–15 miles (22.5–24.1 kilometers). As Kramer climbed toward his cruise altitude, he deviated from the Visual Flight Rules (VFR) Flight Plan which he had filed with the nearby Hawthorne Flight Service Station prior to takeoff. Without authorization from Air Traffic Control, the pilot entered a segment of the Los Angeles Terminal Control Area. Aeroméxico Flight 498 was a regularly-scheduled flight from Mexico City to Los Angeles, with intermediate stops at Guadalajara, Loreto and Tijuana. 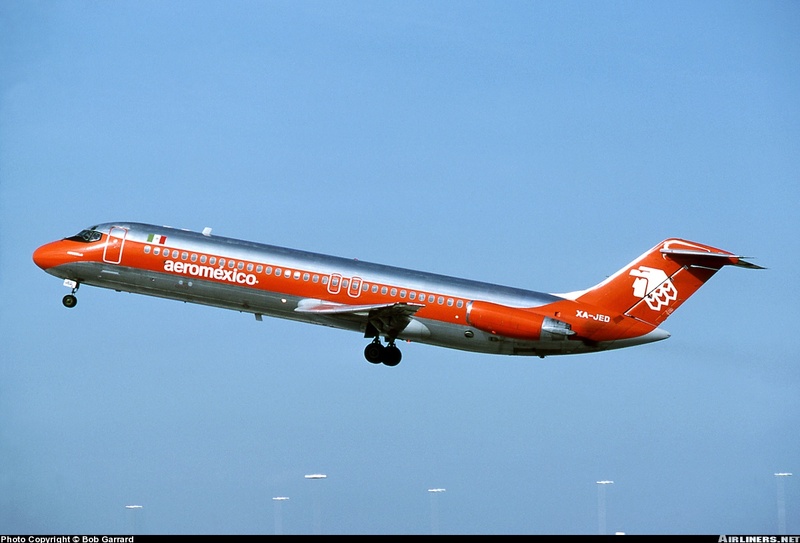 The airliner was a 1969 McDonnell Douglas DC-9-32, serial number 47356, owned by Aeronaves de México S.A., and registered in Estados Unidos Mexicanos (Mexico) as XA-JED. Aeroméxico had named it Hermosillo. The pilot in command of the airliner was Captain Antonio Valdez-Prom, with First Officer Jose Hector Valencia. There were four flight attendants and 58 passengers. The DC-9 was descending from 10,000 feet (3,048 meters) for an instrument approach and landing at Los Angeles International Airport (LAX). Flight 498 was descending in northwesterly direction, while the Archer was climbing, eastbound. At 11:52:09 a.m., as the DC-9 descended through an altitude of approximately 6,660 feet (2,030 meters),¹ the Piper collided with the left side of the DC-9’s vertical fin, just below the horizontal stabilizer. The angle of collision was approximately 90°. The airliner’s entire horizontal stabilizer and rudder were torn from the aircraft. 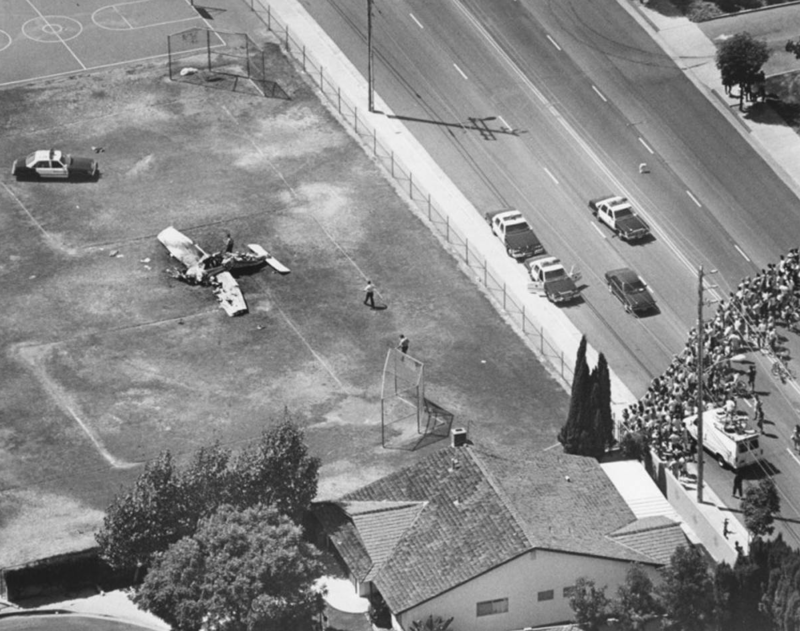 All three persons aboard the light airplane were decapitated.² The Archer was heavily damaged, and with no one left alive to fly it, crashed on the playground of Cerritos Elementary School. 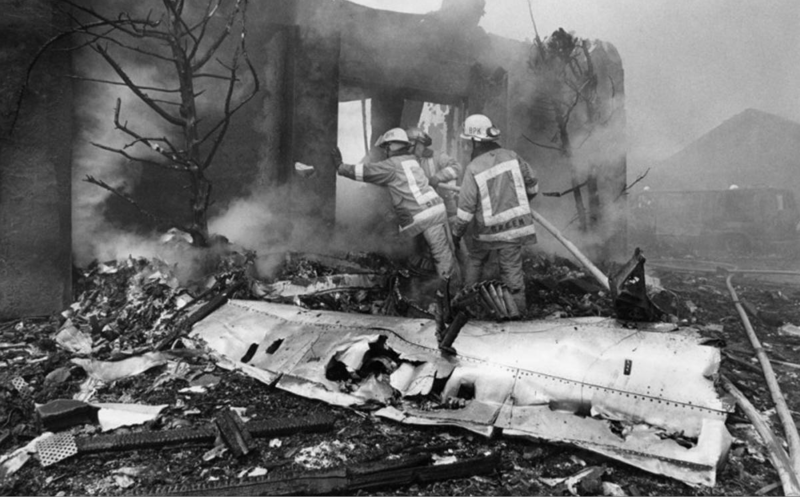 The Aeroméxico pilots had no way to control their damaged DC-9. It rolled inverted and crashed into a residential neighborhood in Cerritos, California. 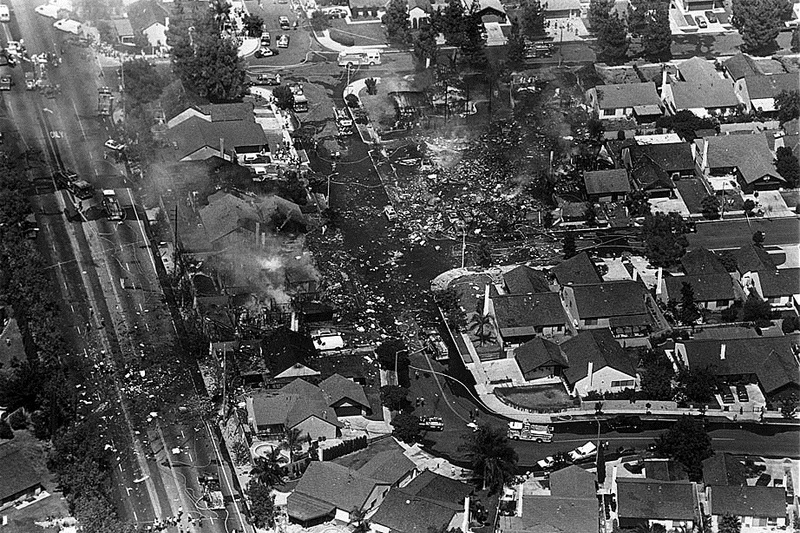 All 64 persons on the DC-9, and another 15 on the ground, were killed. Eight persons on the ground were injured. Five homes were destroyed and another seven were damaged. William Kenneth Kramer held a Federal Aviation Administration Airman’s Certificate with Private Pilot privileges and an Airplane–Single Engine Land rating. His medical certificate required that he wear corrective lenses while flying. Kramer had been licensed by the FAA for six years, and at the time of the accident, he had flown a total of 231 hours. Kramer had moved to the Los Angeles area from Spokane, Washington, less than a year earlier. He had made just seven flights, totaling 5.5 hours, in one of the most complex and congested Terminal Control Areas in the United States. Captain Antonio Valdez-Prom had been employed by Aeroméxico for fourteen years. He held Airline Transport Pilot certificates in both Mexico and the United States, and was type-rated in the DC-9. He had flown a total of 10,641 hours, with 4,632 hours in the McDonnell Douglas DC-9. First Officer Jose Hector Valencia had been employed by Aeroméxico for just over two years. He was a licensed Commercial Pilot in both Mexico and the United States. He had flown a total of 1,463 hours, with 1,245 hours in the DC-9. Like Kramer, Valencia was required to wear corrective lenses. The National Transportation Safety Board determines that the probable cause of the accident was the limitations of the air traffic control system to provide collision protection, through both air traffic control procedures and automated redundancy. 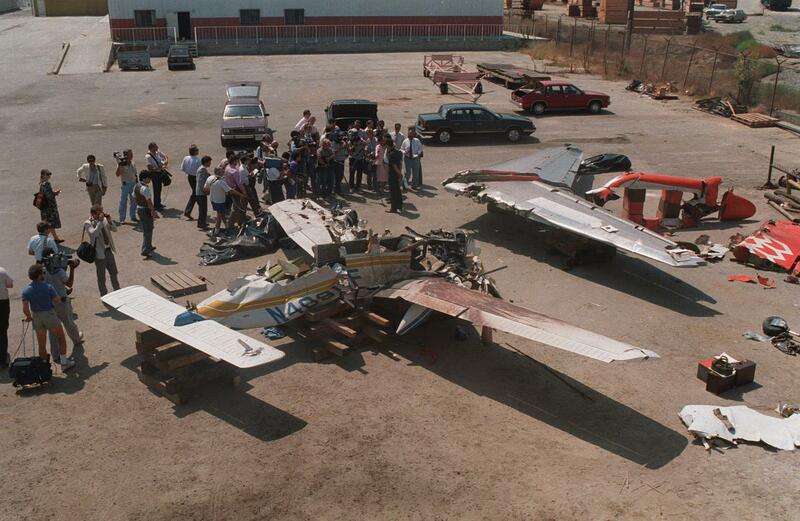 Factors contributing to the accident were (1) the inadvertent and unauthorized entry of the PA-28 into the Los Angeles Terminal Control Area and (2) the limitations of the “see and avoid” concept to insure traffic separation under the conditions of the conflict. It is the opinion of This Day in Aviation that the Probable Cause of this accident as determined by the National Transportation Safety Board was a political statement. As far back as 1956, with the mid-air collision of a United Air Lines Douglas DC-7 and a Trans World Airlines Lockheed Super Constellation over the Grand Canyon of Arizona, the Civil Aeronautics Board and its successor, the NTSB, had repeatedly placed emphasis on the role of air traffic control (or, the lack thereof) in a number of mid-air collisions, and had been recommending numerous improvements. TDiA believes that these recommendations were valid. However, coming to a political conclusion hides the actual cause of the accident. When investigators look for a cause, they evaluate each individual factor. That single factor, which, if it had not occurred, results in no accident taking place—all other factors being the same—is the cause. 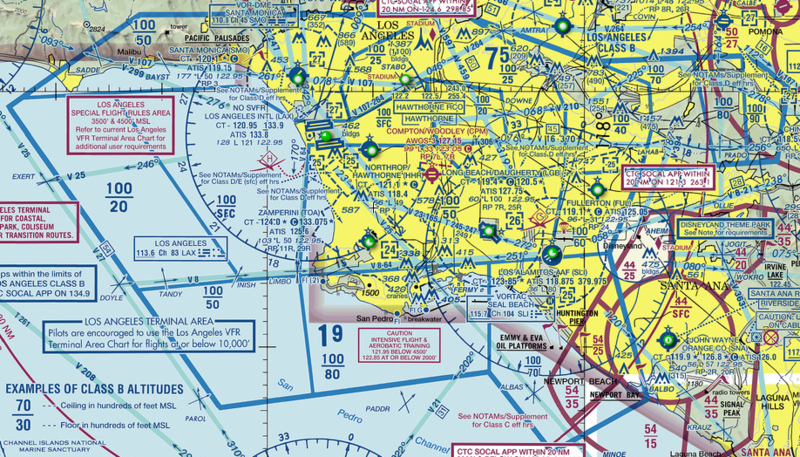 In this case, the pilot of the light airplane had filed a Visual Flight Rules flight plan that would have taken him initially to the southwest from Torrance Airport toward Long Beach Airport, and around the controlled airspace of Los Angeles International Airport. If he had followed his planned route no collision would have occurred. 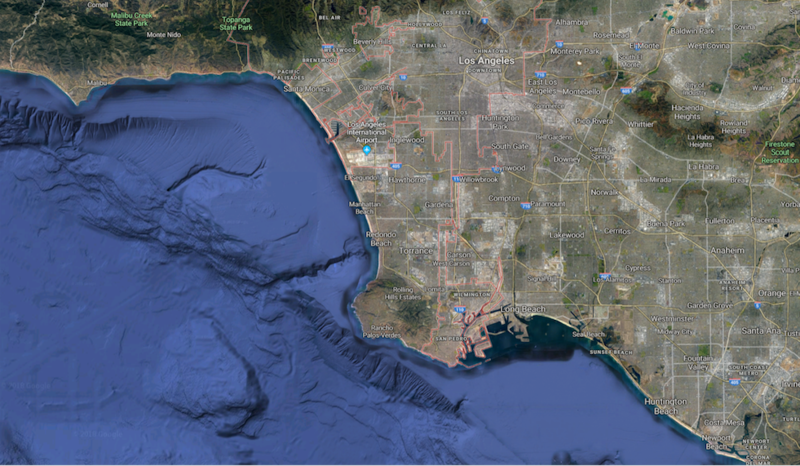 However, he flew directly east and as he climbed, he entered the Los Angeles TCA without ATC clearance. This was a significant violation of FAA regulations. If the crew of Aeroméxico Flight 498 had performed in exactly the same way, flew the same path and descent, but the Piper Archer had remained clear of the TCA as required, there would have been no collision. If air traffic controllers involved with the airliner and the private airplane had performed in exactly the same way as they had, but the Archer had not violated the TCA, there would have been no collision. The inescapable conclusion is that William Kramer, by flying into the Los Angeles Terminal Control Area, caused the mid-air collision between his airplane and the Aeroméxico DC-9. ¹ The Piper Archer’s altimeter was recovered and examined. Although the three pointers were missing, traces of paint from the pointers, called “slap marks,” were found on the dial face at positions corresponding to an altitude of 6,560 feet (1,999 meters). 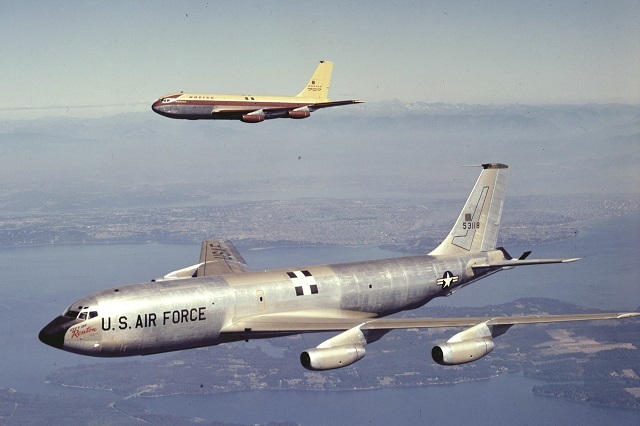 31 August 1956: The first production Boeing KC-135A Stratotanker, 55-3118, named City of Renton, made its first flight with company test pilots Alvin Melvin (“Tex”) Johnston and Richards Llewellyn (“Dix”) Loesch, Jr., on the flight deck. 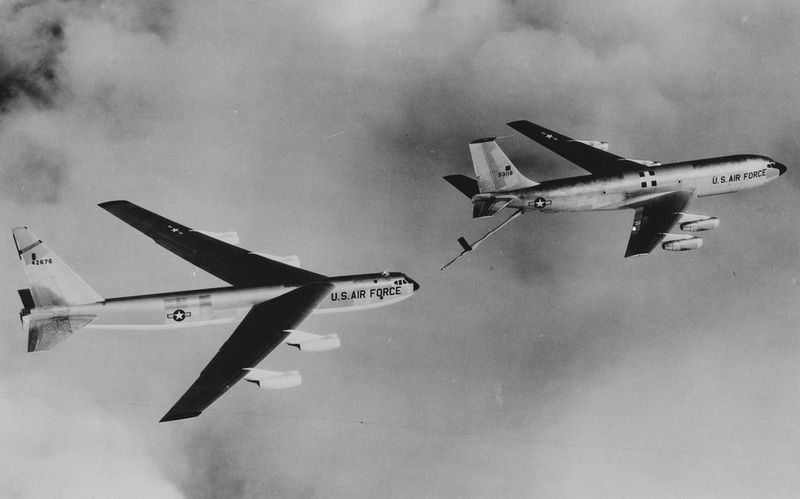 Built as an aerial refueling tanker to support the U.S. Air Force fleet of B-52 strategic bombers, an initial order for 29 tankers was soon followed by three additional orders, bringing the total to 275 airplanes by the end of Fiscal Year 1958.¹ Eventually 732 KC-135As were built by Boeing, and an additional 81 of other versions. The Stratotanker was originally operated by a flight crew of four: pilot, co-pilot, navigator, and refueling boom operator. Upgrades over the decades have simplified operation and the crew has been reduced to two pilots and the boom operator. The tanker’s maximum transfer fuel load is 200,000 pounds (90,719 kilograms). The KC-135 can carry 83,000 pounds (37,648 kilograms) of cargo, and up to 37 passengers.It can also be configured to carry cargo or up to 32 passengers. The KC-135A is 136 feet, 3 inches (41.529 meters) long, with a wingspan of 130 feet, 10 inches (39.878 meters) and overall height of 41 feet, 8 inches (12.700 meters). The Stratotanker’s maximum takeoff weight is 322,500 pounds (146,284 kilograms). 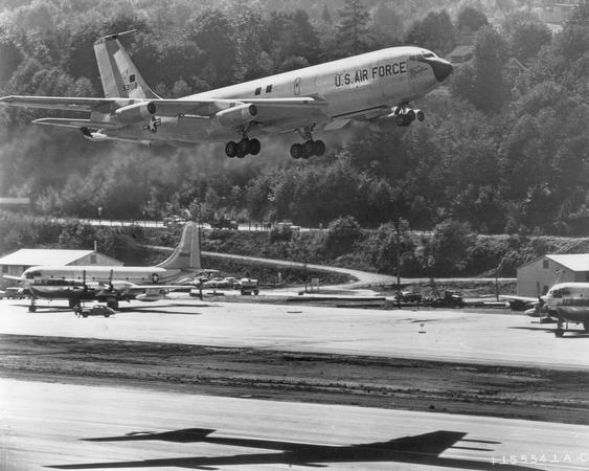 The KC-135A was powered by four Pratt & Whitney J57-P-59W turbojet engines. The J57 was a two-spool, axial-flow engine with a 16-stage compressor section (9 low- and 7-high-pressure stages) and a 3-stage turbine section (1 high- and 2 low-pressure stages). These engines were rated at 13,750 pounds of thrust (61.16 kilonewtons), each. The J57-P-59W was 183.5 inches (4.661 meters) long, 38.9 inches (0.988 meters) long and weighed 4,320 pounds (1,920 kilograms). The Stratotanker fleet has been re-engined with more efficient CFM International CFM56 turbofan engines which produce 21,634 pounds of thrust (96.23 kilonewtons), each. The upgraded aircraft are designated KC-135R. The tanker has a cruise speed of 530 miles per hour (853 kilometers per hour) at 30,000 feet (9,144 meters). The service ceiling was 50,000 feet (15,240 meters). Its range is 1,500 miles (2,414 kilometers) when carrying 150,000 pounds (68,039 kilograms) of transfer fuel, and the maximum ferry range is 11,015 miles (17,727 kilometers). Of the 803 KC-135 aircraft built, 396 remain in service with the U.S. Air Force (as of 14 May 2018). It is estimated that the fleet is 33% through their design lifetime limits. The first production airplane, 55-3118, was used for flight testing. 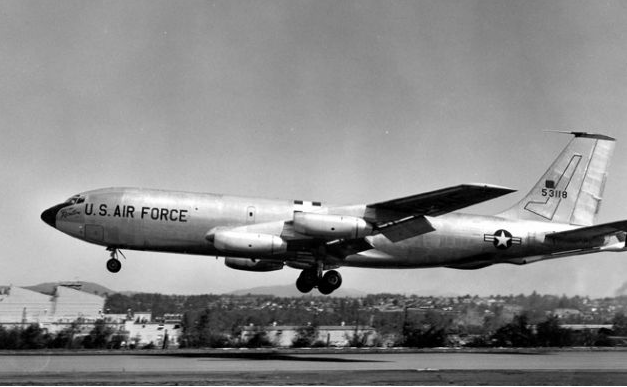 It was later modified into an EC-135K Head Dancer airborne command post. Today, the first Stratotanker is on display at the front gate of McConnell Air Force Base, Kansas. 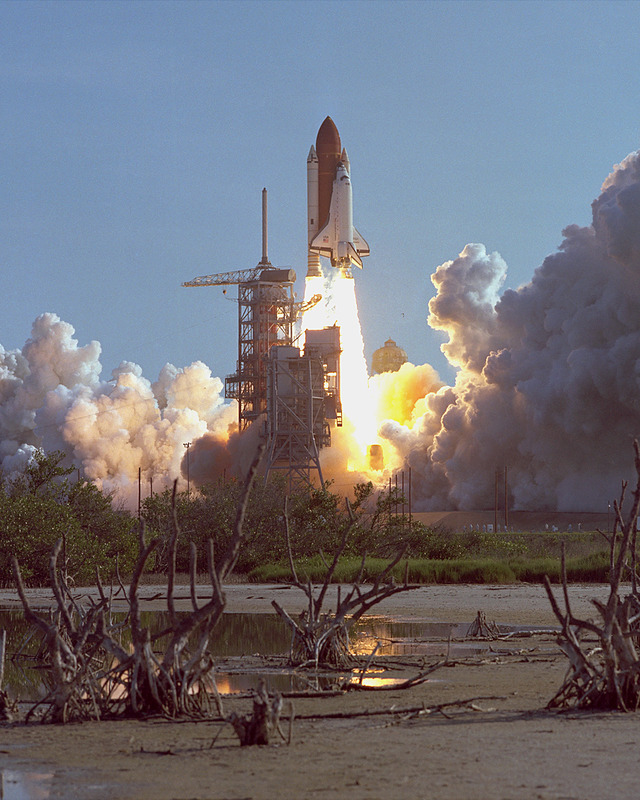 30 August 1984: At 8:41 a.m., EDT (12:41:50 UTC), the Space Shuttle Discovery (OV-103) lifted off from Launch Complex 39A on its first flight into space. This was the fourth attempt to launch Discovery on Mission STS-41-D. 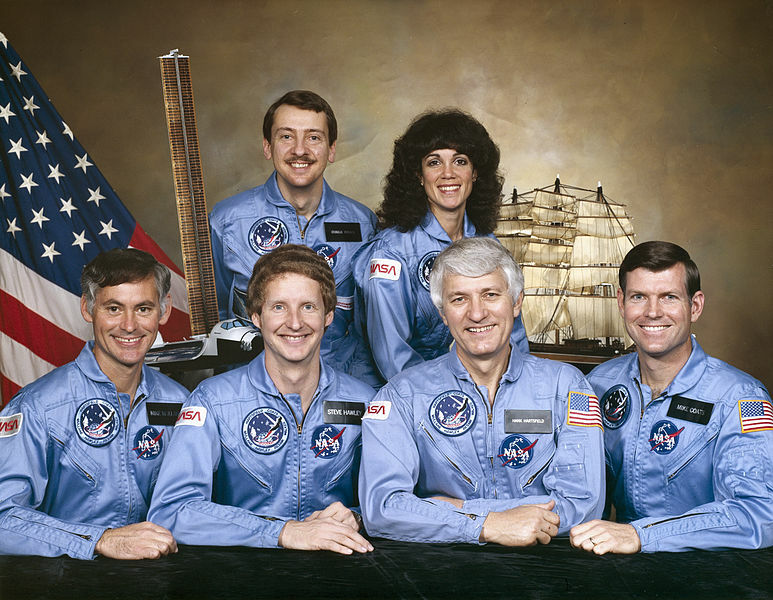 The purpose of the mission was to place three communications satellites into orbit, and to deploy an experimental solar panel array. Various other experiments were also carried out. Discovery touched down at Edwards Air Force Base, California, at 6:37 a.m., PDT (13:37:54 UTC), completing its first flight into space in 6 days, 56 minutes, 4 seconds. 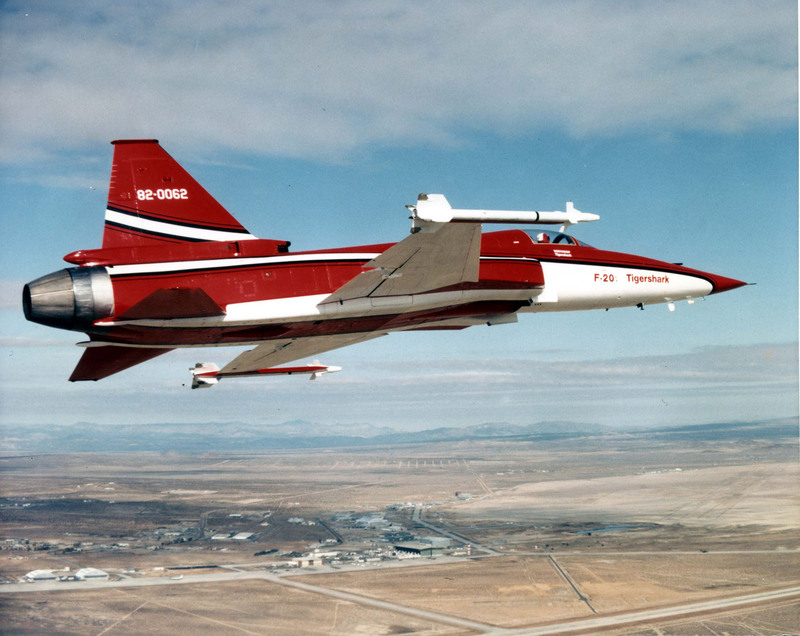 30 August 1982: Northrop test pilot Russell J. Scott made the first flight of the F-5G Tigershark prototype, N4416T, (Northrop serial number GG.1001) at Edwards Air Force Base, California. 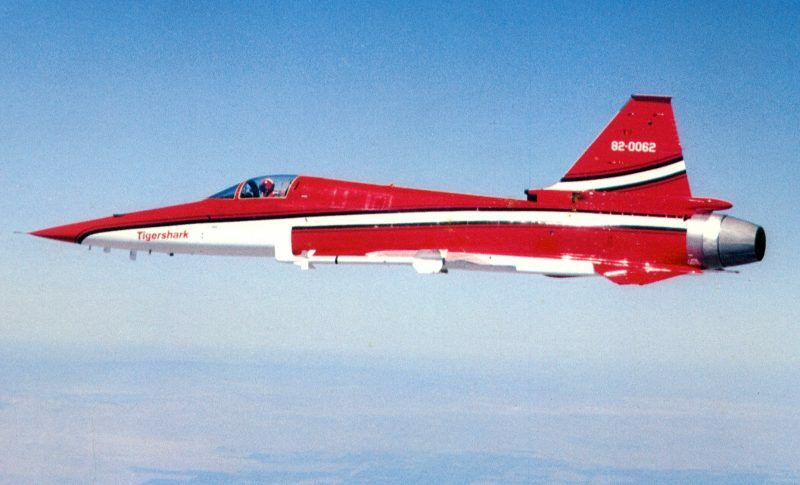 During the 40 minute flight the Tigershark, which would be re-designated F-20A two months later, reached an altitude of 40,000 feet and speed of Mach 1.04. 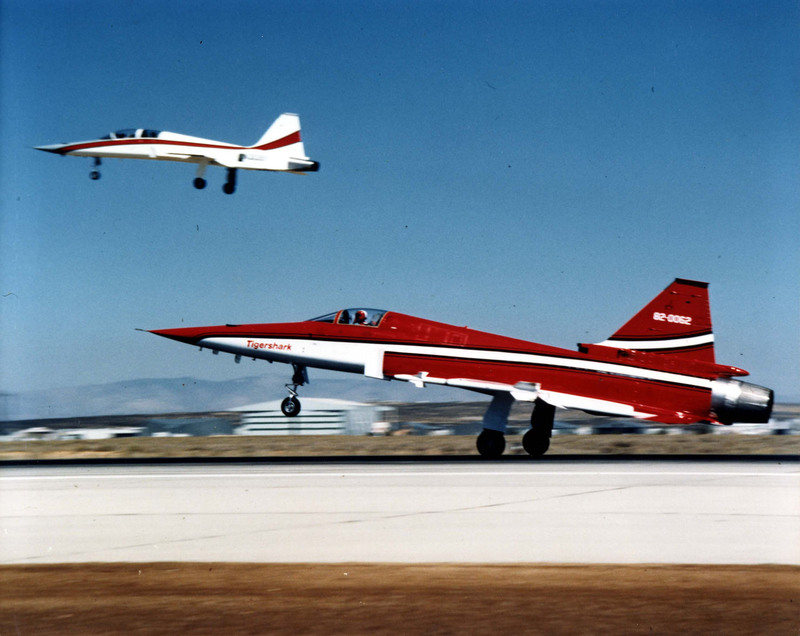 The F-5G was developed by Northrop at the request of the Department of State. U.S. policy at the time prevented the export of front line fighters, like the Grumman F-14 Tomcat and McDonnell Douglas F-15 Eagle, to Allied nations outside of NATO, with the exception of Australia, Israel, Egypt and Iran. Since the Republic of China was building the F-5E under license for its air force, the State Department had asked Northrop to design an advanced fighter based on that earlier type that could be produced in Taiwan. Changing political administrations restricted U.S. export policies and the projected sales of the F-5G, now designated F-20A, did not materialize. The fighter competed against the General Dynamics F-16 Fighting Falcon for an Air Force contract. 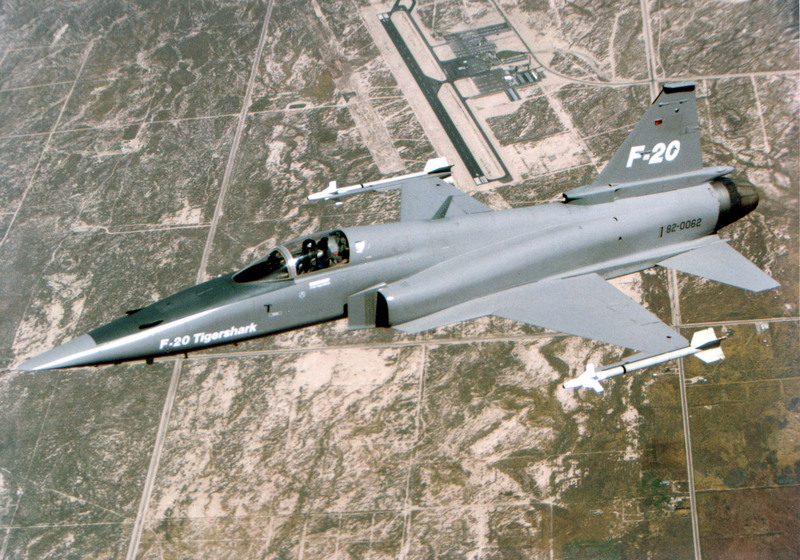 The F-20A was considered to be as good, and in some ways, superior to the F-16. It was also less expensive. 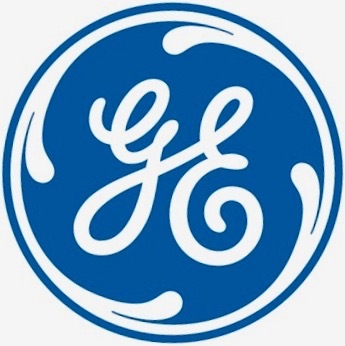 Other factors, though, resulted in the order for the General Dynamics fighter. Developed from the earlier F-5E Tiger II, the F-5G/F-20A Tigershark was a Mach 2+ single-seat, single-engine, light-weight fighter. It was 46 feet, 6 inches (14.173 meters) long, with a wingspan of 26 feet, 8 inches (8.128 meters) with launch rails, and overall height of 13 feet, 10 inches (4.216 meters). The F-20A had an empty weight of 11,220 pounds (5,089 kilograms) and maximum takeoff weight of 26,544 pounds (12,040 kilograms). The F-20A was powered by a single General Electric YF404-GE-100 engine. The F404 is a two-spool, axial-flow, low bypass turbofan with afterburner. It has a 3-stage fan section, 7-stage compressor and 2-stage (1 high- and 1 low-pressure stage) turbine. The the F404-GE-100 is rated at 17,000 pounds of thrust (75.62 kilonewtons) with afterburner. The engine has a maximum diameter of 2 feet, 10.8 inches (0.884 meters), is 13 feet, 2.8 inches (4.034 meters) long, and weighs 2,230 pounds (1,012 kilograms). From a cold start, the prototype fighter could climb to 34,000 feet (10,363 meters) in 2½ minutes. It could accelerate from 0.3 mach to 0.9 Mach in 27 seconds. The F-20A had a maximum speed of Mach 2.1 at 36,000 feet (10,973 meters)—1,387 miles per hour (2,232 kilometers per hour). Its service ceiling was 55,000 feet (16,764 meters). The maximum range with external tanks was 1,715 miles (2,760 kilometers). The Tigershark’s armament consisted of two Pontiac M39A2 20mm autocannon with 280 rounds of ammunition per gun, and two AIM-9 Sidewinder air-to-air missiles carried on the wingtips. Only three F-20As were built. N4416T (82-0062) crashed during a demonstration flight at Suwon Air Base, Republic of South Korea, 10 October 1984. The aircraft was destroyed and Northrop pilot Darrell E. Cornell was killed. The second F-20, N3986B, crashed at Goose Bay, Newfoundland, Canada, 14 May 1985, under similar circumstances, killing David Barnes. Investigations found that both pilots had lost consciousness due to high-G maneuvers. The third Northrop F-20A, N44671 (82-0064), is on display at the California Science Center, Exposition Park, Los Angeles, California. 30 August 1952: At 4:40 p.m., a tragic accident occurred during a fly-by of two new United States Air Force Northrop F-89C Scorpion all weather interceptors at the International Aviation Exposition at Detroit, Michigan. Two F-89Cs of the 27th Fighter Interceptor Squadron, 4711th Defense Wing, based at Griffis Air Force Base, Rome, New York, made a low-altitude, high speed pass in full view of 51,000 spectators, including General Hoyt S. Vandenberg, then serving his second term as Chief of Staff, United States Air Force. Suddenly, the left wing of the lead interceptor separated. The tail also broke away and the fighter crashed and exploded. In the resulting fire, the Scorpion’s 20 millimeter cannon shells detonated. Photograph by B.J. Mullof from The Detroit Free Press, Sunday, 31 August 1952, Vol.122, No. 118, Page 1, Columns 1–3. The crash occurred 4:40 p.m., toward the end of the day’s show. Adams and Richter were swooping down over the field in a “fly-by,” or speed run, Adams flying to one side and slightly to the rear of Recher. Suddenly, Adams’ plane swerved to the right. A piece was seen to break off, then an instant later the right wing tore off. 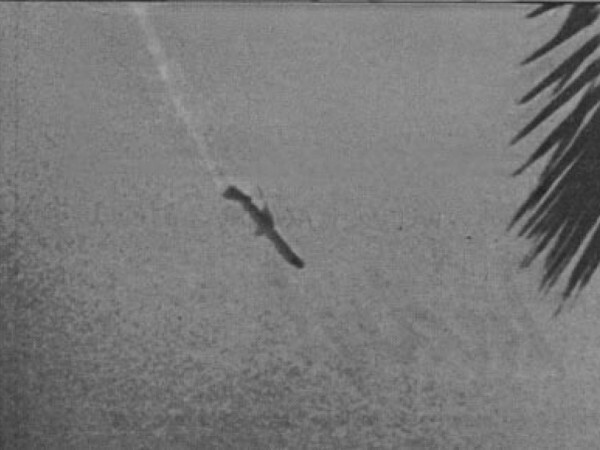 As the pilot struggled to gain altitude, the left wing and tail section ripped off, and the hurtling fuselage continued across the field. It crashed between the railroad tracks and the Willow Run Expressway. It ripped up tracks, fences and telephone lines. Heat from the burning wreck turned the rails cherry red. Two passenger trains, eastbound and westbound, screeched to a halt to avoid piling into the wreckage. Railroad service was delayed an hour until tracks were repaired. . .
AIR FORCE OFFICIALS theorized that the crash was probably caused by turbulent air near the ground added to the stress put on the plane by the maneuver, plus the added thrust of the afterburners, devices which give added “push” to the jet. 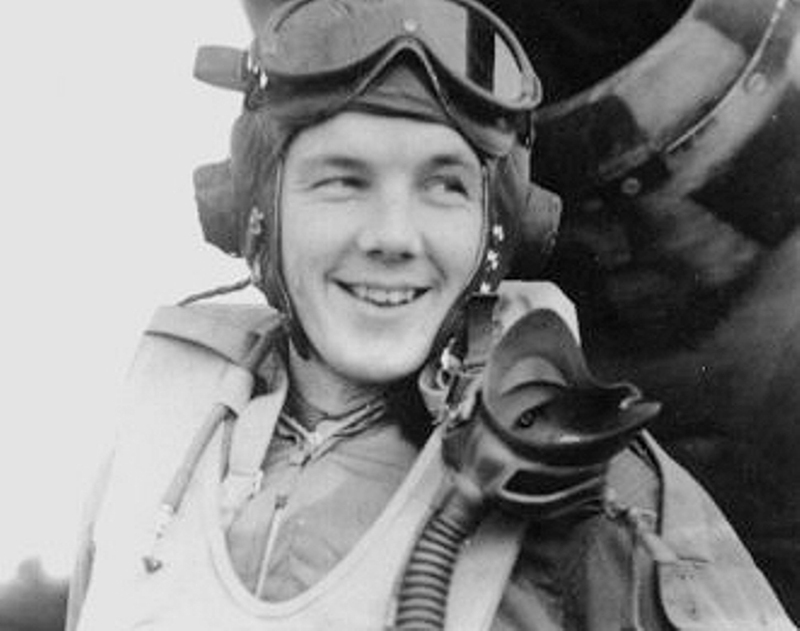 Major Donald E. Adams, a fighter ace who had won the Silver Star in Korea just months earlier, was killed, along with Captain Edward F. Kelly, Jr., the radar intercept officer. Five people on the ground were injured by falling wreckage. 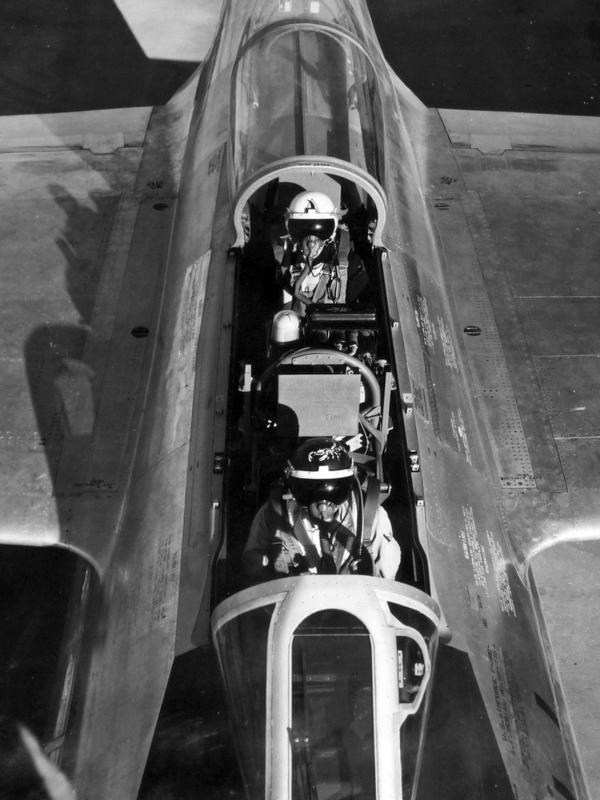 The second F-89 was flown by Major John Recher and Captain Thomas Myslicki. They landed immediately at Selfridge Air Force Base. This was not the first wing failure in an F-89C, nor the last. The Air Force grounded the Scorpions and ordered Northrop to return the airplanes to the factory or to modification centers using the company’s pilots. 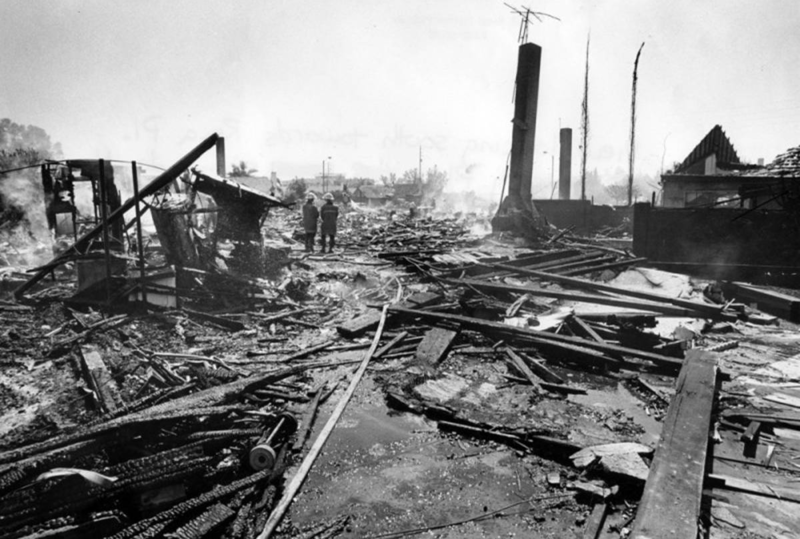 Northrop engineers began an intensive investigation to discover the cause of these catastrophic failures. When designing the airplane, engineers tried to use materials that provided the greatest strength at the lightest weight. A new aluminum alloy had been used for the wing attachment fittings. This material had properties that weren’t understood at the time, but when subjected to certain types of dynamic loads, it could fatigue and become brittle rapidly. It was also very sensitive to surface imperfections, such as scratches or machining marks, that could rapidly propagate fatigue fractures. A second problem was that, under certain conditions, the Scorpion’s wings could enter a sequence of rapidly increasing oscillations, actually twisting the wing. This occurred so quickly that a pilot was not likely to see it happening. The twisting motion focused on the wing attachment points, and resulted in a catastrophic failure. Northrop redesigned the wing to reduce the oscillation, and replaced the aluminum attachment fittings with new ones made of forged steel. 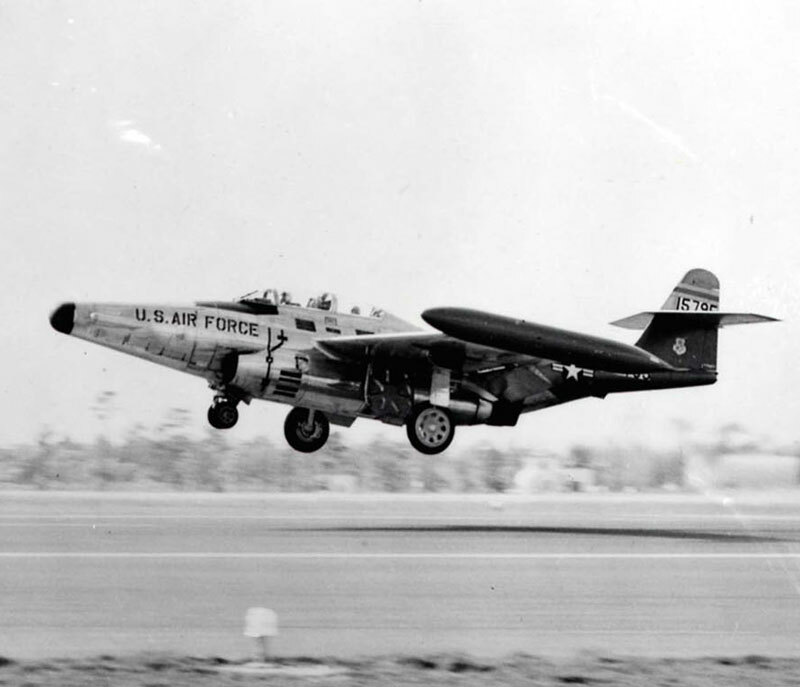 The F-89 was returned to service and became a very reliable airplane. Major Adams’ Scorpion, Northrop F-89C-30-NO 51-5781, was a two-place, twin-engine, all weather interceptor, designed as a replacement for the World War II-era Northrop P-61 Black Widow night fighter. It was operated by a pilot and a radar intercept operator. 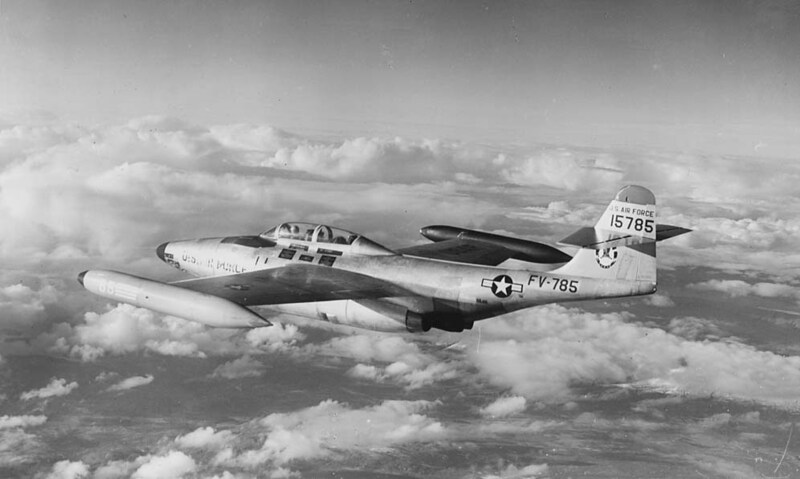 The F-89C was 53 feet, 5 inches (16.281 meters) long with a wingspan of 56 feet, 0 inches (17.069 meters) and overall height of 17 feet, 6 inches (5.334 meters). The wings’ leading edges were swept aft 5° 8′. There was 1° dihedral, and the angle of incidence was 1° 30′. There was no twist. The total wing area was 638.0 square feet (59.27 square meters). The F-89C had an empty weight was 24,958 pounds (11,321 kilograms) and maximum takeoff weight of 37,619 pounds (17,064 kilograms). Northrop F-89C-30-NO Scorpion 51-5785, sister ship of Major Adams’ interceptor. 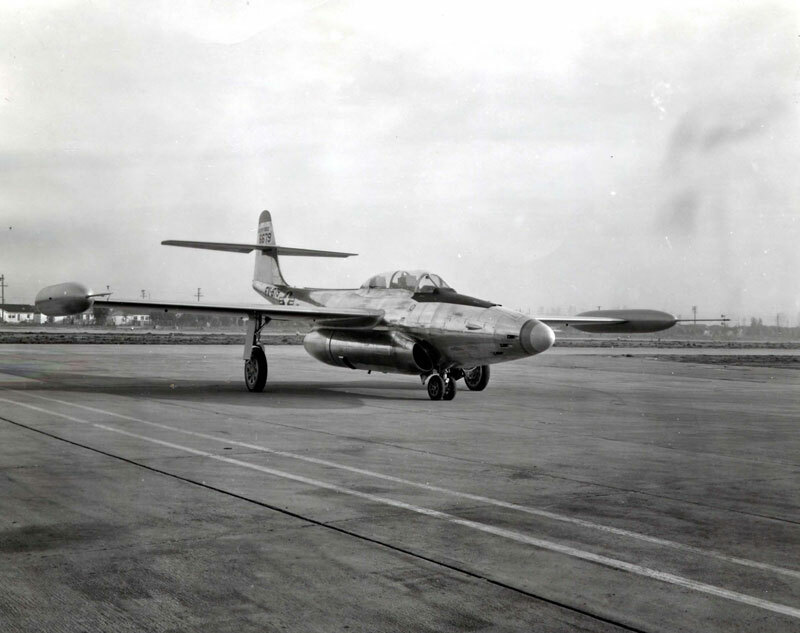 The F-89C was powered by two Allison J35-A-21B or J35-A-33A afterburning turbojet engines. The J35 was a single-spool, axial-flow turbojet with an 11-stage compressor section, 8 combustion chambers, and single-stage turbine. 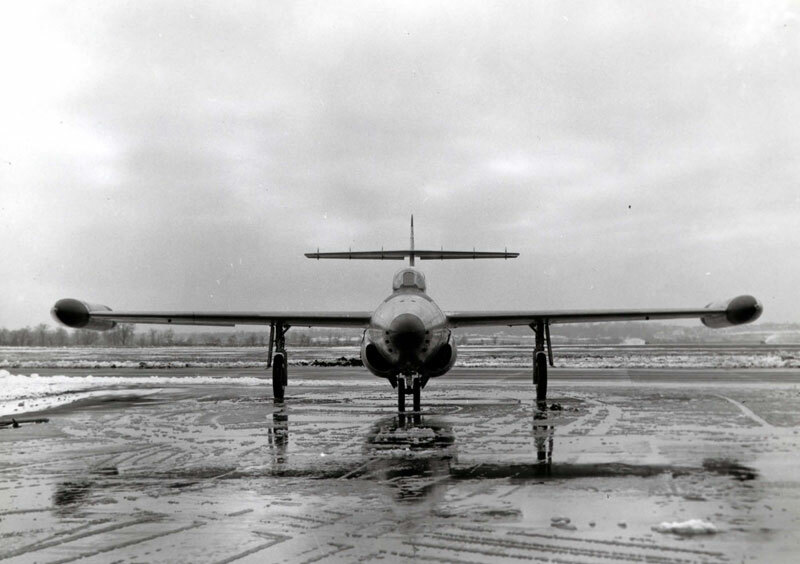 The J35-A-33 had a maximum continuous power rating of 4,800 pounds of thrust (21.35 kilonewtons) at 7,650 rpm. Its military power rating was 5,400 pounds of thrust (24.02 kilonewtons) at 8,000 r.p.m. (30-minute limit), and it produced a maximum 6,950 pounds (30.92 kilonewtons) at 8,000 r.p.m. with afterburner (5-minute limit). The J35-A-33A was 3 feet, 1 inch (0.940 meters) in diameter, 16 feet, 3.5 inches (4.953 meters) long, and weighed 2,725 pounds (1,236 kilograms). It had a maximum speed of 547 knots (629 miles per hour/1,013 kilometers per hour) at 10,550 feet (3,216 meters). It could climb to 40,000 feet (12,192 meters) in 8.4 minutes, and 50,000 feet (15,240) in 17.5 minutes. The service ceiling was 51,550 feet (15,712 meters) and combat radius 297 nautical miles (342 statute miles/550 kilometers). The maximum ferry range was 768 nautical miles (884 statute miles (1,422 kilometers). The interceptor was armed with six M24A-1 20 mm autocannon in the nose, with 200 rounds of ammunition per gun. Northrop Corporation built 1,050 F-89 Scorpions. 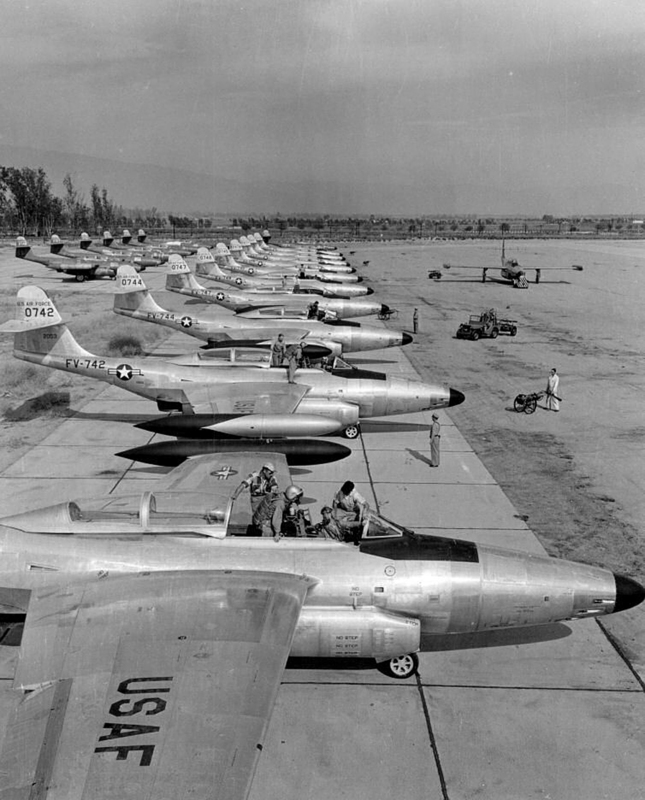 164 of these were F-89Cs. 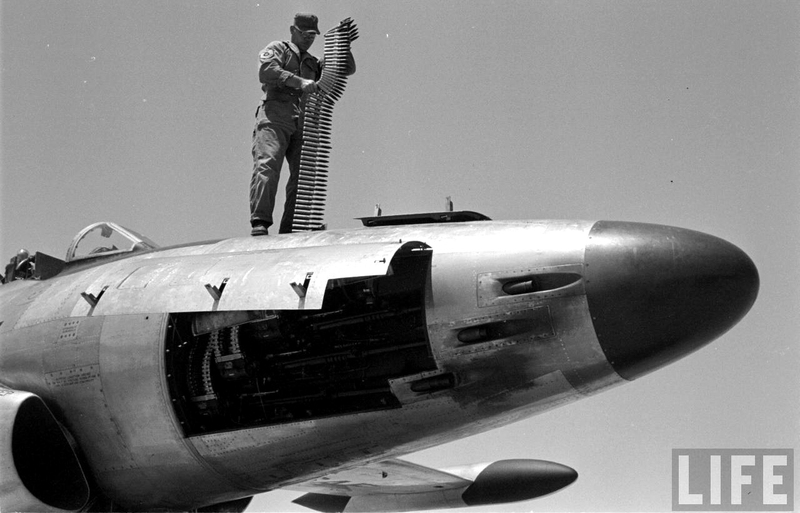 Variants produced after the F-89C deleted the six cannon in the nose and used aerial rockets instead. Scorpions served the Air Force and Air National Guard in the air defense role until 1969. Donald Earl Adams was born 23 February 1921 at Canton, New York. He was the first of two sons of Alonzo Deys Adams, a wallpaper and paint salesman, and Mae C. Hurd Adams. Adams attended Western State Teachers College, Kalamazoo, Michigan. He was a member of the baseball, boxing and wrestling teams. After graduating from college, Adams enlisted as a private, Enlisted Reserve Corps, at Rochester, New York, 10 October 1942. He was 6 feet, 0 inches (1.83 meters) tall and weighed 155 pounds (70 kilograms). Private Adams was appointed an Aviation Cadet, 18 November 1942. 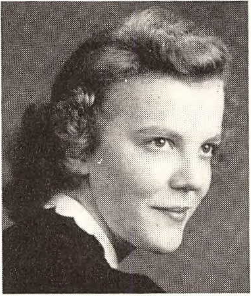 On 13 February 1943, at Montgomery, Alabama, Adams married Miss Mary Ann Lewark, the 21-year-old daughter of Mr. and Mrs. Glenn W. Lewark, and a graduate of Western Michigan College at Kalamazoo. They would have three children, Donald, Nancy and Steven. On completion of flight training, Cadet Adams was commissioned as a Second Lieutenant, Army of the United States (A.U.S. ), 30 August 1943. Lieutenant Adams was assigned as a flight instructor until July 1944, when he underwent operational training as a P-51 Mustang fighter pilot. Second Lieutenant Adams joined the 343rd Fighter Squadron, 55th Fighter Group, at RAF Wormingford (Air Force Station 131), Hertfordshire, in February 1945. He was assigned a North American Aviation P-51D-15-NA Mustang, 44-15372, with squadron markings CY R. He named his fighter Sweet Mary, after his wife. Adams is credited with destroying a Messerschmitt Bf 109 and Me 410 and damaging a second Bf 109, in strafing attacks on the afternoon of 9 April 1945, and a second Bf 109 damaged, 17 April 1945. He was promoted to First Lieutenant, A.U.S., 2 May 1945. On 24 August 1946, Lieutenant Adams was appointed a second lieutenant, Field Artillery, with date of rank to 30 August 1943, his original commissioning date. In November 1946, Lieutenant Adams was assigned to the 307th Fighter Squadron, 31st Fighter Group, on occupation duty at Kitzigen Army Airfield in Bavaria. The 307th was one of the first units to be equipped with the Lockheed P-80A Shooting Star jet fighter. On 1 May 1947, Lieutenant Adams was transferred to the Air Corps. Returning to the United States in June 1947, Lieutenant Adams was assigned to the 62nd Fighter Squadron, 56th Fighter Group, at Selfridge Air Force Base, near Mount Clemens, Michigan. The squadron flew P-80s and F-86 Sabres. In October 1951, Major Adams joined the 16th Fighter-Interceptor Squadron, 51st Fighter-Interceptor Group, at Suwon Air Base (K-13), Republic of South Korea, flying the North American Aviation F-86 Sabre. 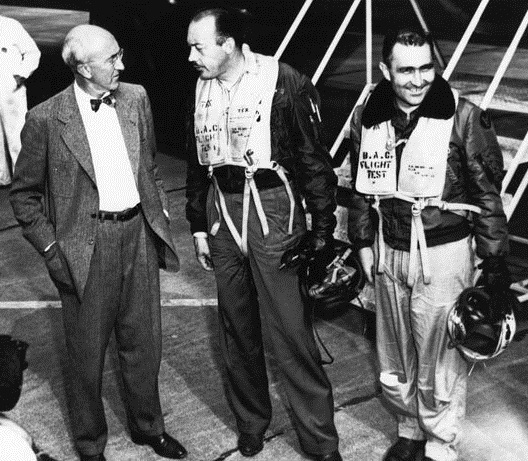 On 3 May 1952, Adams was leading a flight of six Sabres. 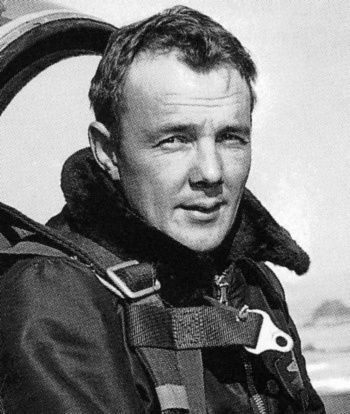 He and his flight attacked a group of twenty Chinese MiG 15s. During the battle, he shot down the enemy flight leader and then the deputy flight leader and damaged three more enemy fighters, completely breaking up the enemy flight. He was awarded the Silver Star. Adams flew 100 combat missions during the Korean War. He returned to the United States 16 June 1952, and in July, was assigned to the 27th Fighter-Interceptor Squadron, 4711th Defense Wing, Air Defense Command, at Griffis Air Force Base. 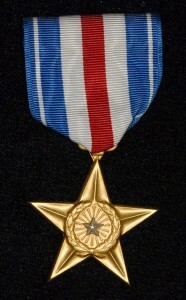 In addition to the Silver Star, Major Adams had been awarded the Distinguished Flying Cross, the Air Medal with one silver and two bronze oak leaf clusters (seven awards), the Presidential Unit Citation with one oak leaf cluster (two awards), the American Campaign Medal, European African-Middle Eastern Campaign Medal with three service stars, World War II Victory Medal, Army of Occupation Medal, National Defense Service Medal, Korean Service Medal with three service stars (three campaigns), the Air Force Longevity Service Award with one oak leaf cluster (ten years service), the Republic of Korea Presidential Unit Citation, the United Nations Service Medal for Korea, and the Republic of Korea War Service Medal. Major Donald Earl Adams, United States Air Force, is buried at the Clinton Grove Cemetery, Mount Clemens, Michigan. Edward F. Kelly, Jr., was born in New York, 5 May 1918. He was the first of four children of Edward F. Kelly, a pawn broker, and Agatha M. Tynan Kelly. Captain Kelly flew 69 combat missions in the Pacific during World War II. He was a resident of New York City.